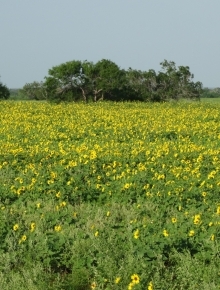 With spring already in full bloom across Texas, now is the time to start planting food plots for dove hunting. Food plots should be composed of species that produce large seeds or grains as doves are seed eaters. Common species planted for doves include sunflower, millet, sorghum, and sesame to name a few. Planting in April – May allows the seeds to mature and be available to doves a couple of weeks before season conditioning them to visit the field when dove season starts. To find out when dove season opens in your area visit: http://www.texasdovehunters.com/tpwd. Dove food plots can vary in size depending on your property and the surrounding habitat. If you have a smaller tract of land, a few acres may be adequate, as long as it is strategically placed on the property. A good location for a food plot, regardless of size, is between good roosting habitat (mature trees) and a water source such as a stock tank or small pond. When planting the food plot, multiple species can be used as they will have different maturation rates and provide food throughout the season. Mourning doves prefer to feed on the ground, so it is a good idea to plant your dove food plot in rows leaving bare ground for them to feed on dropped seeds. Another alternative to leaving bare ground between row plantings is to shred or disc rows in the standing crop. This allows the doves to feed more easily as well as helps hunters locate harvested birds. If you do not have access to a tractor and implements, a drag or harrow can be used behind an ATV or truck to break up the soil, followed by broadcasting a native seed mixture. For more information on planting food plots for doves and where to buy seeds visit: http://www.texasdovehunters.com/seedsandbaiting. When planning dove food plots it is important to not violate baiting regulations for migratory game birds. It is illegal to hunt a baited area where salt, grain, or other feed has been placed. Any baited area is considered baited for 10 days after the removal of all bait. However, it is legal to plant crops and manipulate them with normal agricultural practices, such as shredding, mowing or discing. For more information on dove baiting regulations visit: https://www.fws.gov/le/pdf/dove-hunting-and-baiting.pdf.